There have been many stories throughout the years about how the Bimini Ring Game got started. But, we will not bore you with some long drawn out explanation. Some say it was started in the Caribbean by pirates as early as 1715. Sounds cool, but don't think so. Another claims it happened while on a sailboat traveling the globe with nothing else to do. That's ridiculous. Another person claims that it all began using a bullhorn, not a hook somewhere in England. This sounds like bull to us. And, still another man in the Midwest told us it was started by his uncle. From what we understand he was swinging a rope with a tire tied on it catching it on a broken tree limb. We sent this man medication. However, it was too late. 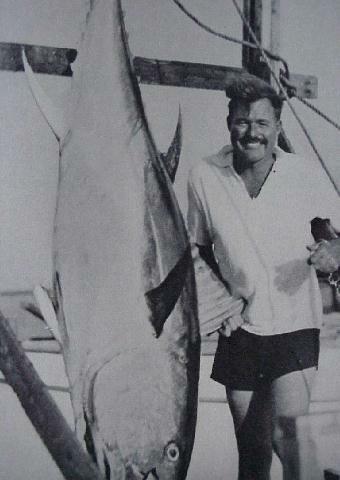 But, the one story we kept hearing over and over from people that would certainly know was that it was started by Ernest Hemingway while on one of his many fishing excursions in Bimini. And this is the one we believe today. 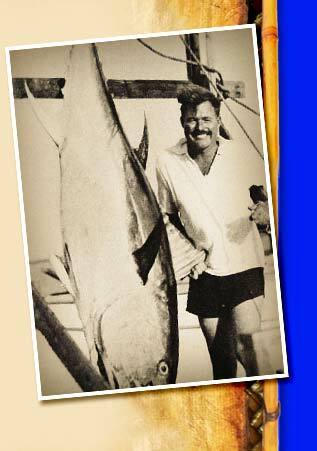 Pictured to the right is Ernest Hemingway with a prize tuna he caught off the coast of Bimini. is believed to be the night he made the first Bimini Ring Game. Bimini Enterprises, Inc. started manufacturing the Bimini Ring Game in Bimini over 40 years ago - on a boat! Every game we make is all about laughs, smiles and good times!